Improving Your Sunroom? 3 Reasons to Get Wood Shutters - Longhorn - Screens. Shades. Shutters. Having wood shutters installed in your sunroom can be a great option for window treatments that still suit the openness that you want in a sunroom. 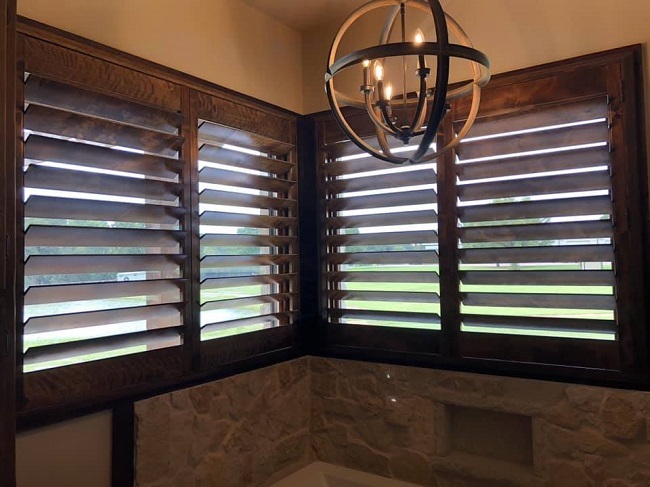 If you’re curious about plantation wood shutters specifically, it’s a good idea to look into custom designs and the benefits that they can provide for your sunroom. The best reason to choose custom designed shutters for the sunroom is the likeliness that standard shutters wouldn’t fit in the windows. Sunrooms often have floor-to-ceiling windows that can require very specific shutters in order for them to fit properly into the windows without any gaps. Measuring out the windows in the sunroom can give you a better idea of what size of shutters will be needed for the sunroom. If you’re curious about adding shutters to enjoy a bit more privacy in the sunroom, it’s a good idea to look for shutters that can entirely block out light as needed. Plantation shutters can provide a tight seal to block out light and add a lot of privacy to the sunroom when desired. Instead of choosing just any window treatments, it’s best to stick with a design that will look fantastic for the sunroom. Plantation shutters can add a lot of style to a sunroom and help tie the room together, allowing you to better enjoy the finished look. Wood finishes can vary greatly as well to let you enjoy a more cohesive look in the sunroom. As you prepare for having window treatments installed in the sunroom, you should look into how plantation shutters can be a perfect fit. Contact us if you have any inquiries about ordering custom designed shutters that can be installed in your sunroom.